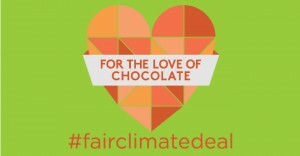 A warmer climate means that cocoa trees will struggle to grow if temperatures continue to rise. 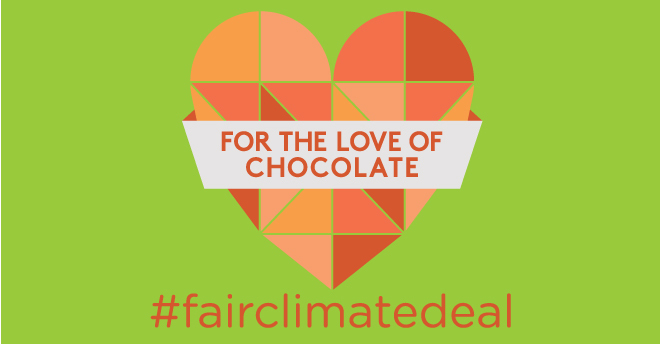 To mark the 21st United Nations Conference of Parties (COP21) which takes place in Paris from 30th November – 11th December, we’ve asked Welsh cafés and restaurants to offer a ‘climate change special’ on their menus, made with Fairtrade chocolate. You can either visit your nearest cafe or restaurant to try their dish of the day or make some of these easy recipes. Or why not do both? Go on, treat yourself! Through this project we hope to achieve increased awareness of climate change and COP21, so that people can get involved and have their say for a fair climate deal this December. 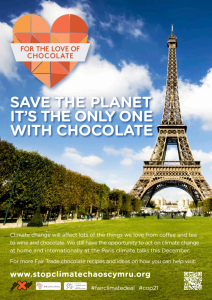 This entry was posted in Events, News, stop climate chaos cymru and tagged cafe, chocolate, climate change, cop21, event, for the love of, paris. Bookmark the permalink.